TipsNotesVideo: Butternut Apple CrispKids Can! In a large bowl, toss the squash, apples and lemon juice. This recipe video was created by the Oregon Farm Direct Nutrition Program. 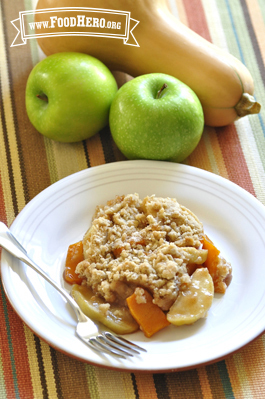 4 Comments for "Butternut Apple Crisp"
We made a small revision to remove the corn syrup from this recipe. It tastes plenty sweet and that's one less ingredient! We love this recipe at our house. We do skip the corn syrup and add 1/2 cup of unsweetened apple juice. Reducing the sugar to 1/2 cup is still delicious and very sweet. We top with low-fat vanilla yogurt. This recipe is very delicious. Would be perfect for fall.